ICICIDirect educates users about financial planning via social media. The social media campaign does this via two animated characters, Gyano and Mobo, who showcase why people need to plan their financial goals via animated videos. Everyone is not a financial wizard and people like me keep a distance from the hassles of financial planning. Today everyone needs to work on financial planning for a safe future. So what if someone educates you in a simple and fun way. ICICI Securities, the integrated securities firm seems to have realized this. The brand has launched an animated social media campaign for its portal ICICIDirect.com in association with Brandmovers and O22 Media. Brandmovers is managing the digital and social presence of the brand. The entire social media campaign has been conceptualized around two animated characters – Gyano, the magician and Mobo, the money boss. The social media campaign has emphasized upon a larger presence on YouTube and integrating with other networks such as Facebook and Twitter. The animated series has been launched under a new tab – Hangout in the brand channel. The video content starts with Gyano the magician who believes in short cuts and living life peacefully but Mobo is a practical man who believes that proper planning can help achieve one’s financial goals leading to a peaceful life. Once the introduction video is over, the Hangout section becomes more animated where users are asked to choose a dream wish such as owning a dream car, world tour, an early retirement, etc. On selection of your wish Gyano turns up and advices you how you can achieve the dream with shortcuts. But as expected the shortcuts end up nowhere and Gyano looks up to Mobo for a rational help. Mobo then pulls up how ICICIDirect planning tools can help you achieve your dreams. For example if you want to buy a house, Mobo will guide you through the ICICIDirect tools that will take some details from you and provide you customized solution on the go. 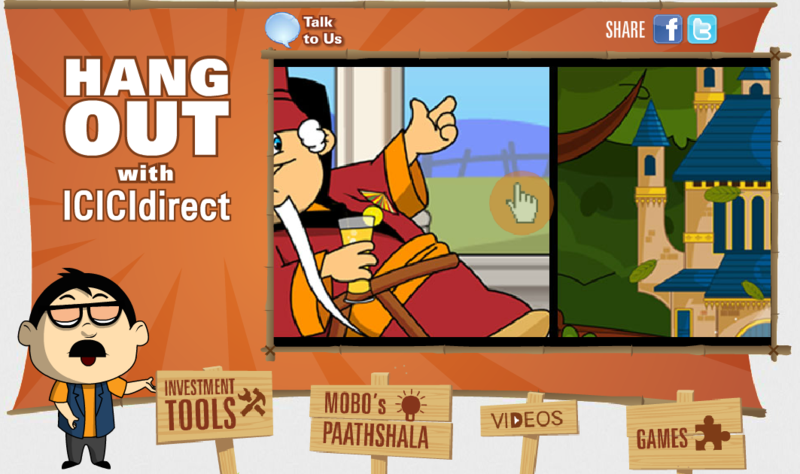 The Hangout also has features like – Investment Tools, Mobo’s Paathshaala, Videos and Games. Investment Tools: On click the user is taken to a Facebook app that has been built on the brand’s Facebook page. The app lists the same wishes that you have seen previously in the Hangout. So if you click on any of the wishes Mobo comes up takes some basic details, asks for your plan and pulls up customized investment solutions provided by ICCI Direct. Mobo’s Paathshaala: On click the user is again taken to a Facebook app which is a collection of useful videos. These videos are divided into two categories – Dream Videos and Learning Videos. Dream Videos are the same set of wishful videos that you have watched in Hangout. The other set of videos are the learning snippets where you are educated about the jargon of investments. Videos and Games: On click of Videos the user is taken back to the home page of the YouTube brand channel. On click of Games the user is taken again to another Facebook app where you can learn about the Virtual Stocks. Once you click on the Virtual Stocks, you are taken out of Facebook to a Virtual Stocks portal where you can experiment and learn. In addition to these Facebook apps, the page which has created a base of more than 3K fans is aggressively promoting the characters and the underline brand message. The page is sharing interesting videos and images that are related to the Hangout campaign. Twitter has also been integrated and the brand with more than 1K followers is creating a decent awareness about the campaign. Gyano and Mobo have occupied the Twitter backgrounds and the tweets are focused around the Hangout campaign. Along with promoting the interesting videos, Twitter presence is actively engaging with users and making finance fun. I have also been told from known sources that we will witness some more interesting initiatives on Twitter in the coming days. How effective is the Hangout Campaign? Video is one of the social media trends that has been slowly catching up since 2012. Hangout is undoubtedly a great initiative that has taken a much serious business like financial planning and tried making it fun to learn and experience. Not only that, the characters also enact real life situations and the brand has made sure that it has emphasized on the message that proper planning alone gives results. The extensive campaign that has been designed focusing on YouTube is impressive. The subtle mixture of the national language Hindi along with English is sure to catch on with the online users. In addition to this, the campaign has been smartly integrated with Facebook along with Twitter. Campaigns need to be integrated smartly so that it not only gets the reach but make fans aware of the entire social presence. 2012 had seen some interesting YouTube campaigns. Movie promotions of Barfi via animated videos on YouTube was catchy but I am yet to see an initiative like this from brands who belong to the highly regulated space. I won’t be surprised to see competing brands come out with similar initiatives in the near future. Campaigns like this not only create new benchmarks but create confidence in the market for other brands to explore and experiment with the medium. So what do you have to say about Gyano, Mobo and the entire Hangout campaign. Disclaimer: Brandmovers is one of our advertisers.